North Atlantic right whales had very a rough year, and they can’t take many more years like it. A new study warns that if we don’t enact tougher and more flexible conservation policies in the face of climate change, the species may be doomed. After centuries of commercial whaling, there are only about 500 North Atlantic right whales left. Although the species received protected status in the 1930s, North Atlantic right whales, which range along the Eastern seaboard from Florida to Newfoundland, have been slow to recover, in part due to deaths from ship strikes and fishing gear entanglement. In the summer of 2017, right whales experienced an “unusual mortality event”—sixteen whales, or roughly three percent of the species, have been confirmed dead in the Gulfs of Maine and St. Lawrence. 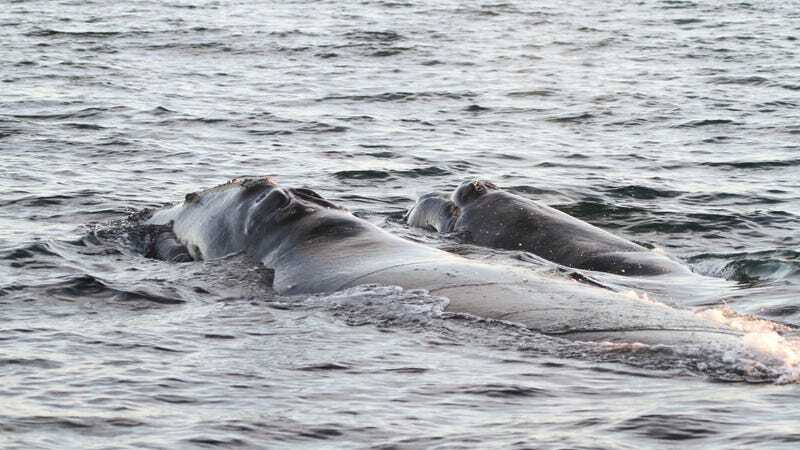 Of the seven carcasses necropsied, six right whales died due to ship strikes or fishing gear entanglement, according to a Cornell news release. Now, a study published in Global Change Biology is warning that right whales can’t handle too many more years like 2017 without sliding into a serious decline. Especially not if climate change reduces the whales’ food supply, tiny crustaceans called copepods. “The population can’t take this kind of mass mortality event,” Cornell oceanographer and study co-author Charles Greene told Earther. Using a population model that included different levels of prey, Greene, along with marine ecologist Erin Meyer-Gutbrod at the University of California, Santa Barbara, projected the growth of species out over the next century. What they found was alarming. These are, of course, just model estimates and not a forecast of the future. But right whale populations have proven quite sensitive to food supply fluctuations in the past. And there is evidence that more food shortages could be the future—particularly in the Gulf of Maine, an important right whale calving ground. There, rapid warming has coincided with fewer right whale observations in recent years. Greene thinks the reason may be a northward shift in the distribution of copepods, toward places like the Gulf of St. Lawrence, which lack strict protection policies because right whales used to be scarce. “It seems that a lack of food availability in the Gulf of Maine is causing [right whales] to look for new foraging grounds in places they’re not protected,” Greene said. The good news is that we already know how to prevent unnecessary right whale deaths. To reduce fishing gear entanglement, managers can restrict themselves to safer types of gear in waters that the whales frequent. To reduce ship strikes, they can either avoid areas where whales congregate, or reduce their speed to the point where a collision would be non-lethal. Better monitoring tools would also help conservationists enact stricter safety measures where they’ll be most helpful. Unfortunately, due to budget cuts, NOAA’s National Marine Fisheries Service recently froze a copepod monitoring program that has provided marine ecologists with data on this critical right whale food source since the late 1950s. Greene emphasized that right whales still have a fighting chance, but only if we become pro-active now. That means figuring out how climate change will impact the species, and shifting conservation strategies accordingly. Correction 11/11: An earlier version of this post referred to North Atlantic right whales as North American right whales. We regret the error.